K-pop Fashion. Appealing and delicious like cake, minus the baking. The fashion in this music video did not really give me that special tingle of “oooh I love what she’s wearing so much that I need to have it“, unlike in my other review of f(x)’s Electric Shock. However, I thought what they’re wearing is still very fresh and definitely street friendly, considering the fact that the music video is all about impromptu dancing at a mall. This down-to-earth image the Wonder Girls decided to opt for this time round for their comeback is again very fresh, and just shows street fashion makes everything more appealing. I really really really love what Sohee is wearing in this stage. It’s filled with attitude, yet again, street friendly, and gives off her inner rocker vibe. I think she is slowly becoming one of my favorite people in the Kpop scene, as I love how she doesn’t seem pretentious. Therefore, everything she wears does not overwhelm her as a performer, but only serve to allow her cute personality to shine through. In this particular performance, she is seen wearing a yellow asymmetric print shirt tucked into a pair of studded shorts, with a pair of sheer black tights to glam up the entire outfit for the performance stage, complete with a pair of fun and colorful sneakers which she flaunts with bright orange and yellow socks. Now that I look at it some more, her outfit gives off a retro vibe which I think is what sets her outfit apart from the other girls’. The outfit is very playful and fun, and is perfect for a girls day out at the mall (very fitting for Wonder Girls’ new single), or hopping on the exhilarating rides at your local amusement park. As you can tell by now, I am a fan of comfortable outfits that can be worn on any day, so Sohee’s outfit here fit the criteria very well. 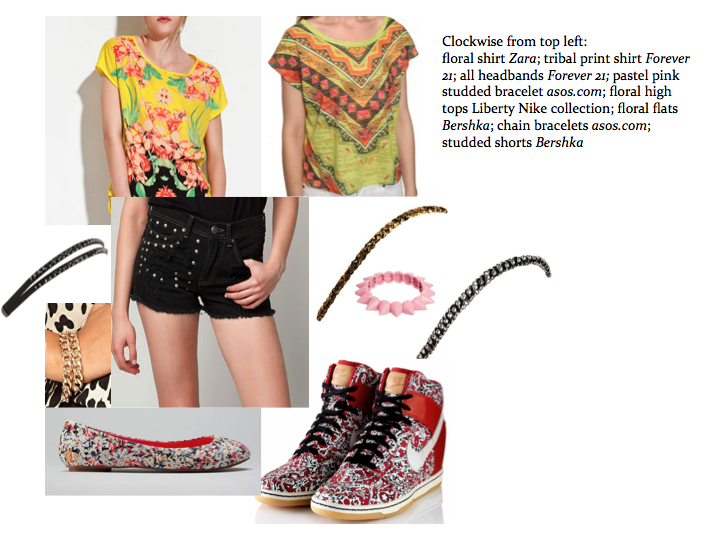 I am in love with the new Nike x Liberty London collection, which I have featured in the above collage. The print is amazing, and this particular pair of high tops has heels neatly hidden inside the shoes just for the inner diva in all of us. I think it’s a fun twist on Sohee’s style, making it more street friendly yet trendy all the same. I also think a pair of colorful flats like the floral ones above from Bershka will work for this outfit, however, it takes away a lot of the fun in Sohee’s outfit, which I feel like is all about embracing the fun and easy going side of street fashion. Moreover, unlike Sohee, who most likely has a stylist personally style her hair for this TV performance, most of us don’t have that liberty, therefore I think headbands will give the same style seen on Sohee without half the trouble. Hope you have had as much fun reading this as I have reviewing the fashion in Wonder Girls’ “Like This”! Wanna know when a fresh Kpop fashion review comes out?